Every year I say that I am going to carve an elaborate pumpkin. You know, one of those carved masterpieces you see. Every year I put off the carving and never get to it. This year is no different. 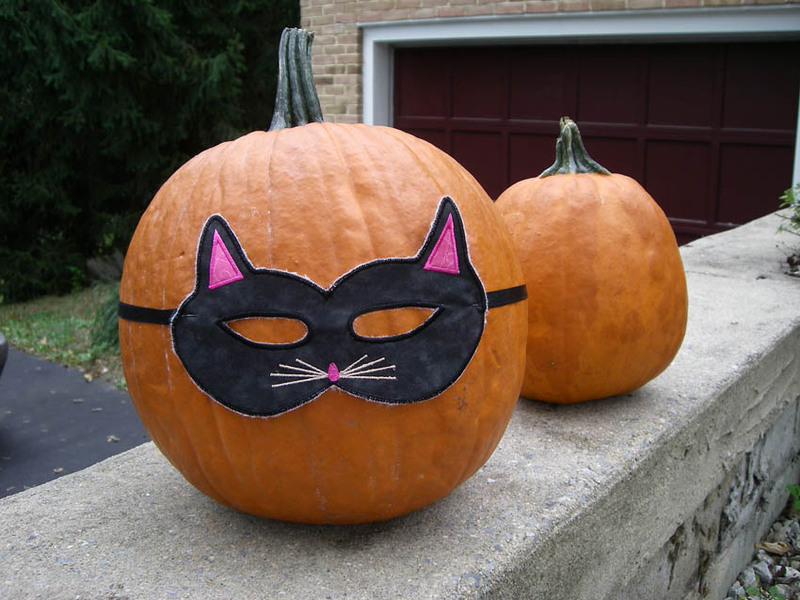 However, this year I decided to create some embroidered masks to at least dress up our pumpkins. I drew and digitized two masks. One is a kitty cat disguise and one is a masquerade mask disguise. I have to admit, I'm happy with the results. I made the cat mask first yesterday. I digitized the design and appliqued the ears pink. I also added metallic thread for the whiskers. I think the whiskers part took the longest since the thread kept breaking. I pinned on the ribbon to the side of the mask (sometimes pins are just the right craft tool) and then pinned on elastic in back. As one of my blogging friend cleverly said... it's purrrfect. I had so much fun with that one that I wanted to do another one. It would be either a dog or a sparkly mask. Any chance to use rhinestones wins the choice for me every time. 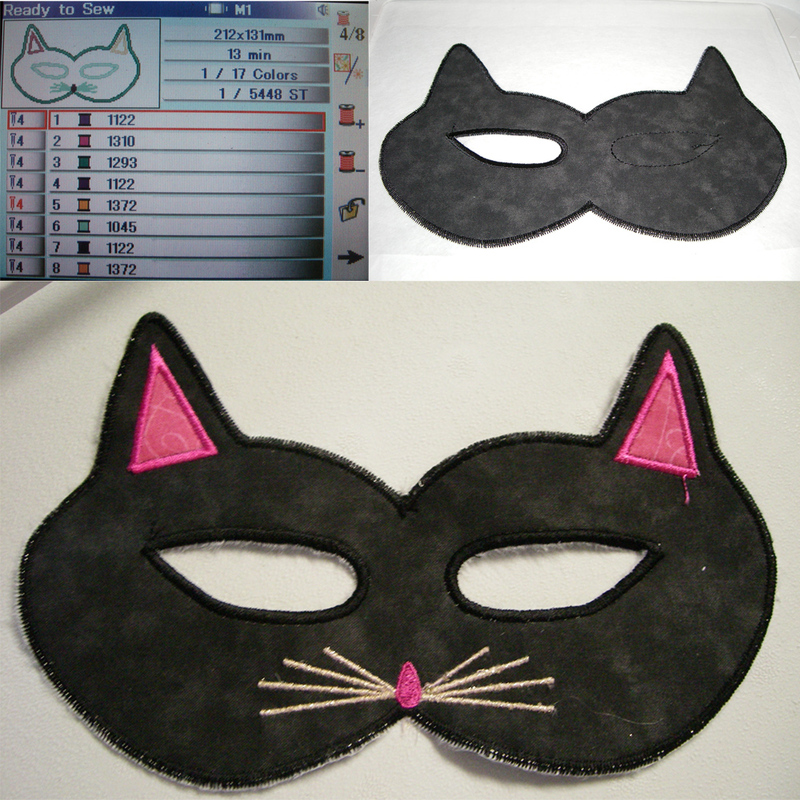 So I drew a mask outline and added an embroidery design to the overall mask. Then I used the satin outline last around the mask. This time, I used pliers to add grommets to the side of the mask. This made it easier to add the elastic to the mask. Of course I used pins to secure the eleastic again. This allows me to easily change the sizes. 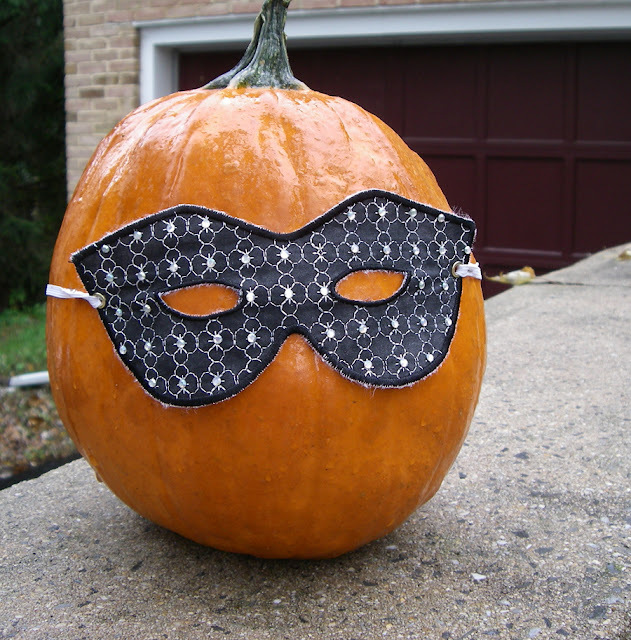 It's a dreary rainy day here in central pa so my pumpkin photo is not that cheery. However, once the sun shines later on in the week, I expect the mask to work it's magic for Mr. pumpkin.